Adulterated vermicelli has flooded different markets in the capital ahead of Eid-ul-Fitr, one of the biggest religious festivals of the Muslims, posing a serious threat to public health. As the demand for vermicelli (semai), a popular dish on Eid day, is now very high, many businessmen have set up vermicelli factories illegally to make extra profits. Besides, dishonest traders have set up manually-operated machines in different parts of the capital to produce substandard vermicelli and market them under famous brand names, sources said. They said substandard vermicelli is being produced in a dirty and unhygienic condition and widely marketed for consumers. 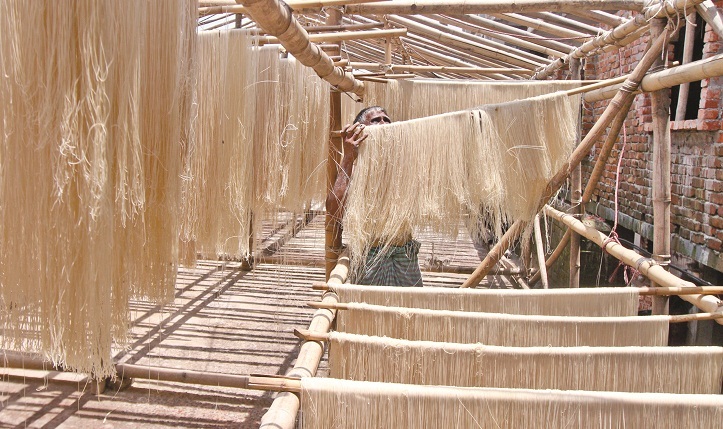 Some businessmen are producing vermicelli without following the formulas set by the Bangladesh Standard Testing Institution (BSTI) to make a mint, they said. Another source said such fake factories are located in Lalbagh, Hazaribagh, Chawk Bazar, Keraniganj and Kamrangirchar areas in the capital. Sources said production process goes on secretly keeping main entrances of those fake factories under lock and key so that nobody can enter there. There are allegations that unauthorised mill owners have long been carrying out such illegal business by managing some dishonest officials of the authorities concerned. While visiting a factory in old part of the capital, it was seen that workers were making vermicelli in a very dirty environment. They were processing raw materials with their hands without any safety measures. Some factories stock vermicelli in unhygienic place. Low quality flour and ghee, and burnt soybean oil etc are being used to produce substandard vermicelli. Besides, vermicelli is dried up under the open sky. Then, the low quality vermicelli is being marketed under different brand names, sources said. Experts are of the opinion that regular consumption of such vermicelli can lead to various health complications. On June 2, a mobile court of Rapid Action Battalion (RAB) in an anti-adulteration drive fined four factories in old Dhaka for producing adulterated vermicelli and marketing the product. RAB along with the members of Bangladesh Standards and Testing Institute (BSTI) raided Chawk Bazar area to check adulteration of the popular item. The mobile court fined the owners of Khokon Traders of Chhoto Katara Tk 4 lakh, Chan Mian Store Tk 3 lakh, Dohar Store Tk 3 lakh and Bangladesh Store Tk 13 lakh for packaging vermicelli, noodles and chips in an unhygienic condition. When contacted, Professor Dr Khaleda Islam of the Institute of Nutrition and Food Science at Dhaka University (DU) said adulterated vermicelli is highly dangerous for human health. “Anyone can suffer from diarrhoea and dysentery after consumption of adulterated vermicelli,” she said. She also said children are the worst sufferers of adulterated vermicelli. Textile dyes used to colour vermicelli can damage kidney and liver of a consumer. “Regular consumption of adulterated vermicelli can cause cancer,” she added.